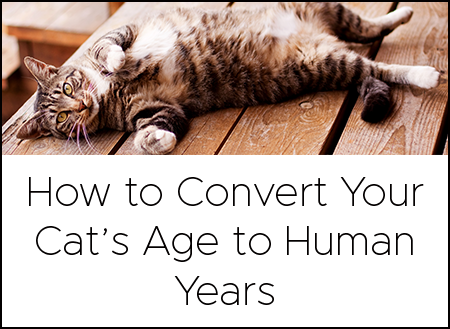 Whether you’re a university student trying to fit your whole life into a small apartment, a senior citizen sizing down from a big house, or your home just isn’t that big, finding space to accommodate Kitty can be difficult. So what’s the secret to tiny living with cats? Maximize vertical space. One way to maximize vertical space is to create climbing surfaces where cats can play and scratch without using any floor space. In other words, build upward. For most folks, that means parking one of those giant, carpet-covered cat condos in the living room. You can find them in various configurations at just about any pet store. But do you really want to? 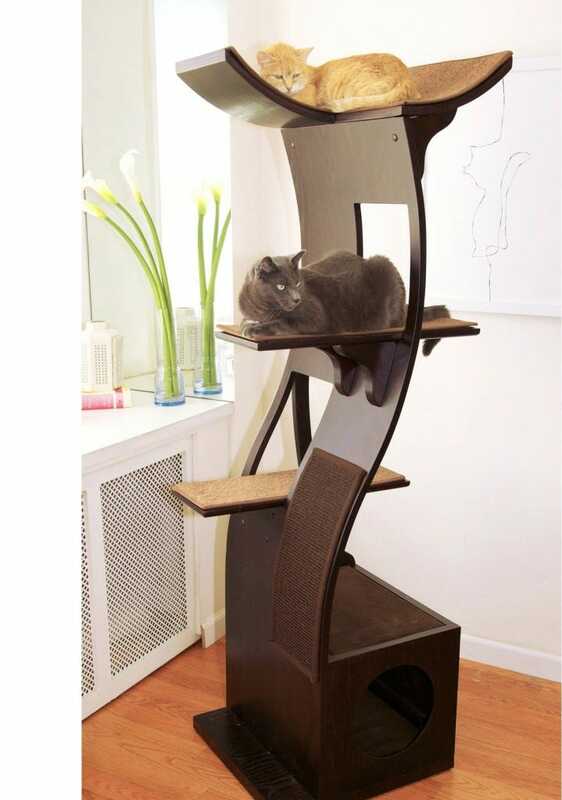 Plenty of creative and more visually appealing vertical cat playgrounds are available. 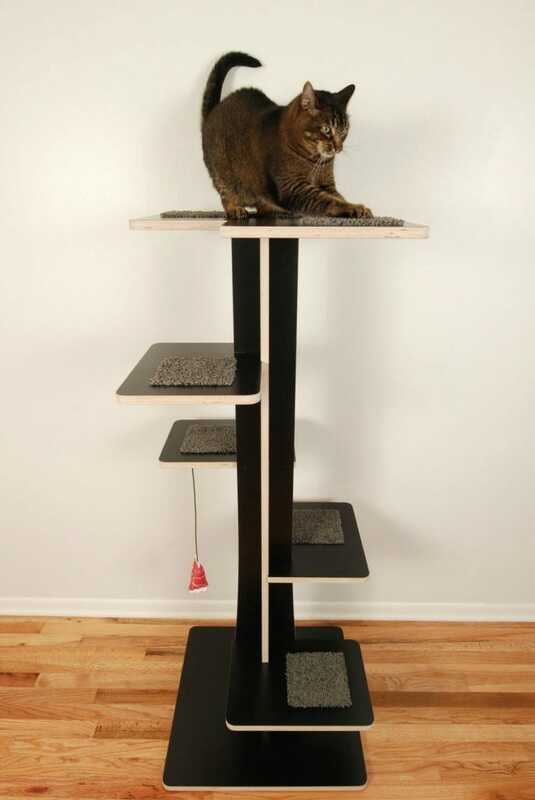 For example, there are multilevel cat trees and climbing platforms (some with dangling toys!) that fit nearly any decor. They usually offer a smaller footprint than a cat condo and have multiple wooden or wood-veneer shelves jutting out from a central pillar covered in scratchable jute. 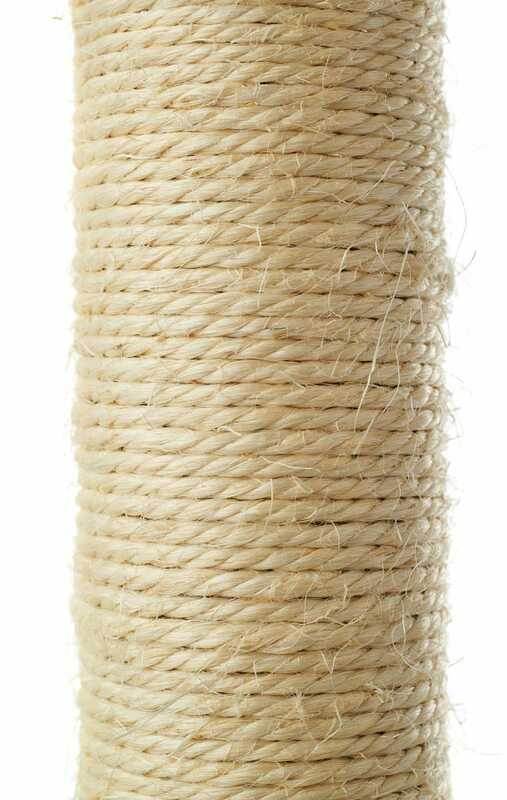 If you’re handy, you can even install a floor-to-ceiling climbing post and then wrap it with sisal rope for your cat to grip onto for climbing and scratching. You’ll need several 100-foot reels, because you’ll be wrapping around (and around and around) the post. A four-inch-thick circular post will take around three reels to wrap from floor to ceiling. 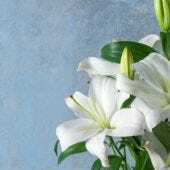 If the post is thicker or square rather than round, your mileage may vary. Check out a detailed how-to here. Simpler cat trapezes and climbing ropes are also available and can be stowed away as needed. If your cat is older or has mobility issues, however, a trapeze or climbing rope may be too difficult for her to negotiate without falling. If you’re really adventurous—and you have an accommodating landlord who will let you drill holes in the wall studs—you can do what Jackson Galaxy of the popular Animal Planet show My Cat From Hell calls “catification.” A catified apartment or house has cat-specific shelves lining the perimeter of the room to create a walkway with no dead ends and a safe place for your kitty to jump down to the ground. 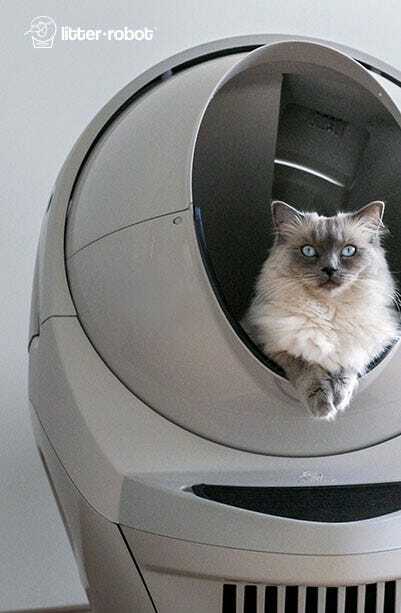 Tiny living with cats has never been so fun! 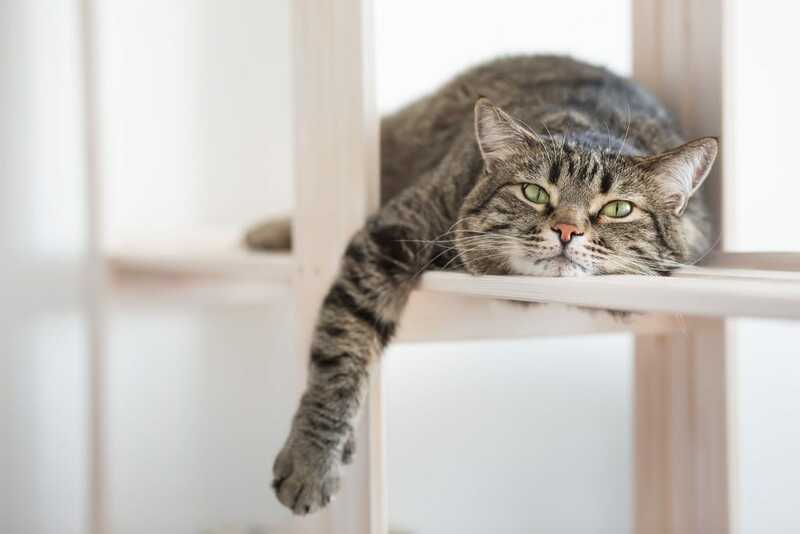 Make sure your shelves and how they’re attached to walls are solid enough to hold your cat’s weight, especially if the arrangement requires Kitty to jump from shelf to shelf. If you need some inspiration, Animal Planet viewers have submitted photos and descriptions of their own catified homes. 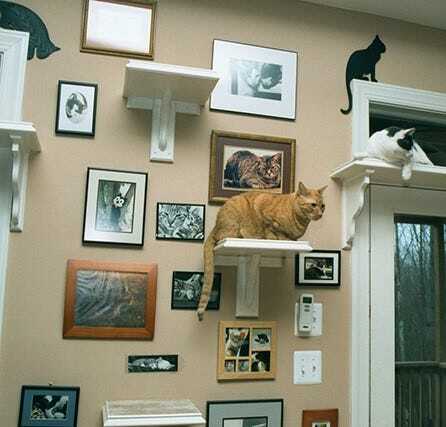 One especially cool design integrates the cat shelves with wall art (see photo). But even if your heartless landlord won’t let you make holes in the wall, don’t worry; you can catify your place without wrangling two-by-fours. Bookcases and other furniture make perfect cat perches. Just ensure that surfaces aren’t covered with attractive breakables that your cat can (read: will) knock down. 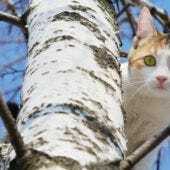 Most importantly, check that bookcases and other improvised cat walkways and perches are solidly built and stabilized. Much of the build-it-yourself furniture is unstable, which is why manufacturers include a stabilizing strap or piece of hardware in the box, especially with tall items. If you have to strap furniture to a wall stud just so it can stand safely, it probably won’t be sturdy enough for your furry little gymnast. Look around your home; you probably have many things that can be repurposed as a kitty playground. 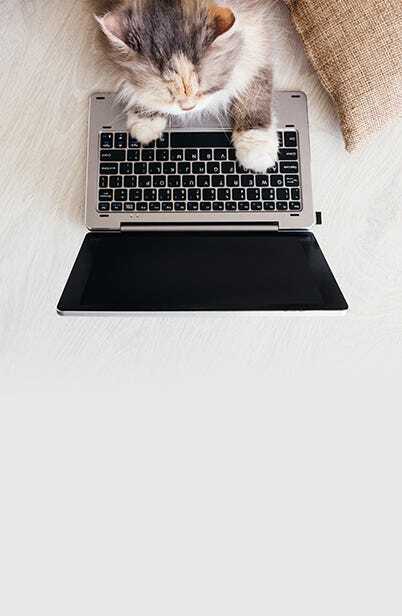 Figure out what pieces can do double duty—stowing clothes, papers, games, books, videos AND serving as a secret feline walkway—and rearrange them to your (cat’s) heart’s content. Check out our Pinterest board to see how other folks handle tiny living with cats! 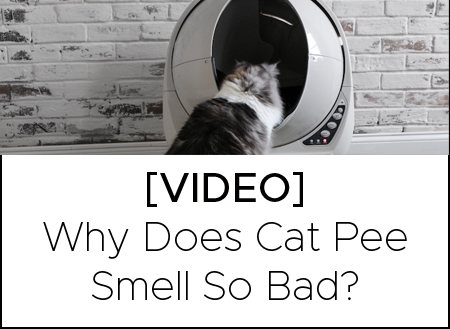 Next Post Cat Allergies: Why are so many people allergic?